Engineers with the Space and Missiles Combined Test Force at Arnold Air Force Base are developing a telemetry package that will be used to transmit data when launching projectiles at over 25,000 Gs. To accommodate a stand-alone electronics package, an antenna with a detachable radome and multiple integrated sensors, the projectile itself is made up of different parts and materials. 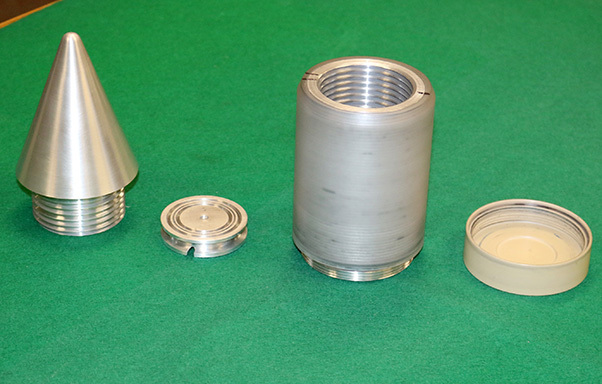 Shown are the various parts of the project and then the projectile when totally assembled. Engineers with the Space and Missiles Combined Test Force at Arnold Air Force Base, Tenn., are developing a telemetry capability that will be used to gather, transmit and record data when launching projectiles at over 25,000 Gs and more than 13,000 miles per hour. Elvis Encalada, electrical engineer at Arnold, commented that the use of telemetry arose from the need to study boundary layer transition. Projectiles experience BLT, the transition from laminar to turbulent flow, when traveling at very high speeds. The specific location along the projectile body where BLT occurs is a critical parameter that effects the flight dynamics of the projectile. In addition to Encalada, Jesse Labello, Air Force project manager, and David Woods, mechanical engineer, have contributed to this effort. Woods led the team in designing the modular projectile, which, according to Labello, was no easy feat due to the specifications required. During the developmental phase of the telemetry system, the three engineers partnered with the Army Research Lab (ARL). He added ARL assisted in the process of properly integrating the electronics and mechanical bodies. To get an even better understanding and to see the telemetry package in action, Encalada took a trip to Aberdeen Proving Grounds. APG, which is located in Aberdeen, Maryland, conducts various kinds of military equipment development and tests which include weapons, ammunitions, artillery and vehicles. 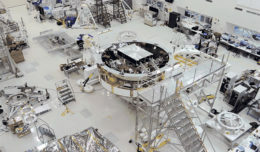 While here, Encalada said he saw how vital potting the electronics inside the mechanical housing is in the electronics surviving the high G-force environments. After potting was completed at APG, the team traveled to the Adelphi Laboratory Center in Maryland. Testing of the telemetry package in Range G at Arnold is anticipated to take place sometime next year. “We hope that the end result will be that AEDC test customers will receive critical data about boundary layer transition during hypersonic flight and hypervelocity impacts that were previously unable to be measured,” Encalada said.